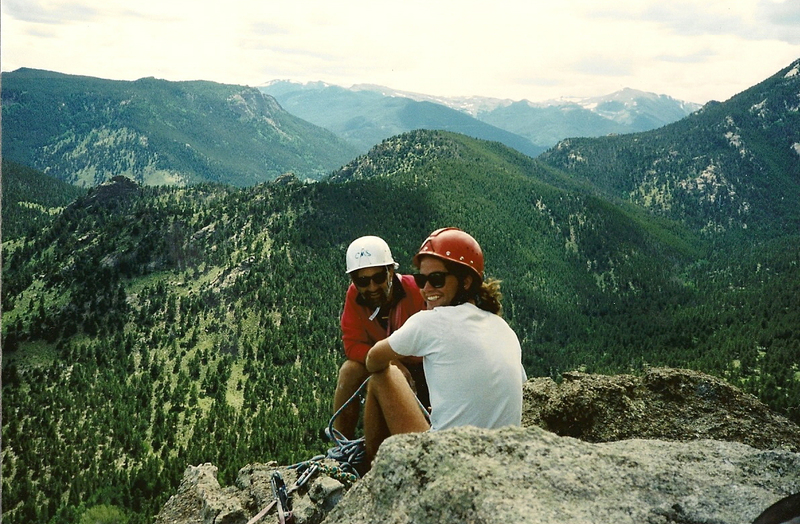 On July 5, 1992, I clawed my way up Pear Buttress in Lumpy Ridge, Estes Park, Colorado. This was my first multi-pitch climb and was significant otherwise for two important aspects of my climbing style: Ignorance and Fear. And, it was nearly the last climb I ever did. I’ll start with ignorance. I didn’t know anything about rock climbing. I had bluffed my way into an ‘Intermediate’ level class because I was afraid of being bored in a ‘beginner’ course. I was a fool; I started my climbing career with a 5.8 classic. My ignorance accounted for the fact that I selected my street shoe size when asked what rock shoe size I wear. What did I know about rock climbing shoes? My feet swam in rock shoes built for Michael Jordan…and did not hurt me one bit. In fact, I could not begin to understand the complaints from my fellow climbing students whenever we descended in our rock shoes later in the week-long course. Also, it explained why I had no ability to stand on anything smaller than a sidewalk. As a ‘Leg Hauler’, I did more pull-ups that day than I had done in my life to-date. Still, I was able to do it, somehow. My ability to exceed my physical limitation was related to the second important aspect of my climbing style. Fear. For the 1st time in my life, I knew stark terror. I discovered that I had a fear of heights. Living in flat Florida, I just didn’t know. On the first pitch, I followed Topher, my CMS guide up the standard start. We went up the slab right of a giant flake and then quickly stepped left to get to the flake. It formed a perfect hand crack (5.7) that was good enough even for a climber without any technique. 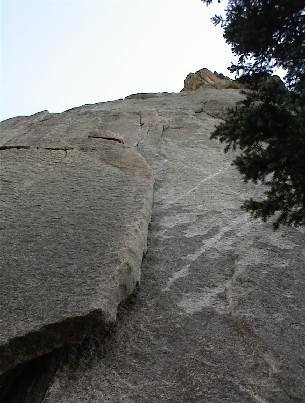 Once at the top of the flake, I attempted to follow thin cracks (crux) up to a sloping ledge where Topher built a belay. The key was a little ‘crystal’ for my right foot that I needed to step up on to reach a hand crack. I couldn’t do it; my foot kept slipping off. After 5 or 6 unsuccessful attempts, I felt my first sensation of being “gripped’. I felt terrible about failing and about ruining the climb for everyone else. My vision tunneled and my other senses began to shut down as my mind went into melt-down, just like Colossus when presented with an unsolvable problem (“what happens when an unstoppable object hits and immovable object?”). A fly buzzing about my head seemed to be tormenting me in my life’s weakest moment. It was the Devil. I just wished it would all end so I could go home and say that I tried rock climbing but did not like it. Topher only said, over and over, “try again”. In a fit of anger, I managed to step up and reach into the crack. Thank God. The rest of the climb went pretty much the same: I yelled out “falling” whenever I thought the possibility was high and tried to keep to myself any thoughts of how Pear Buttress would be the one and only rock climb of my LONG life. But first I had to finish. On the second pitch, we followed the ledge up and left to the edge of the face, then cut back right into a crack which we followed to a belay on a smaller ledge (5.4). 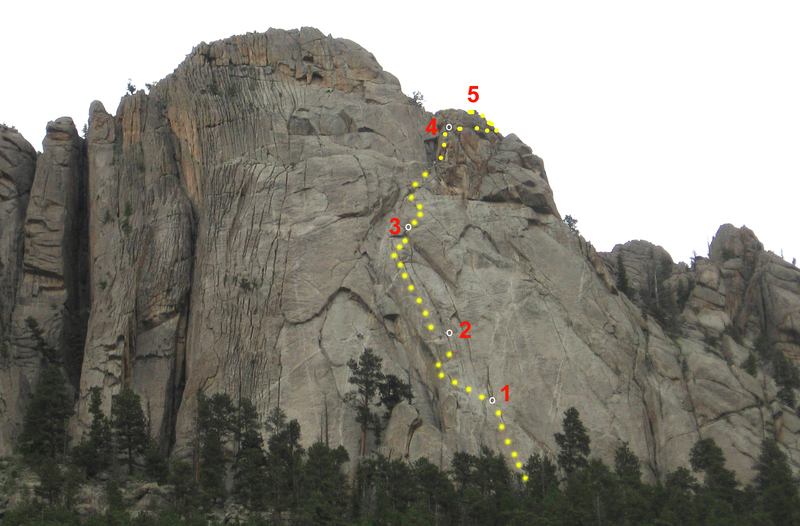 The third pitch followed a hand and finger crack above the belay for 100 feet (5.8). By this time, my hands and fingers were just hamburger…I painted the route with my blood, and still have some of the scars. The pitch finished with a traverse right under a small roof to a belay on another ledge. The fourth pitch was easy going as we climbed toward a ‘cave’…but the face climbing to reach the awkward belay was nearly too much. Finally, we traversed out of the cave to reach the greatest amount of exposure the world could present (I thought), but a short climb to the top got me out of harm’s way. When I pulled my body up and over the top and shook Topher’s hand, I had an overwhelming sense of satisfaction come over me that was unmatched until the birth of my 1st child nearly 10 years later. Topher bringing up another of the students to the top of the Pear Buttress route. I had just completed the most physically and emotionally demanding effort of my life … and I was going to live to tell about it. I “knew” in my head that this climb would be my last; but my heart couldn’t forget that feeling…that overwhelming sense of satisfaction. See First Alpine Adventure trip report (the climb done on Sharkstooth at the end of the week-long class. This entry was posted on September 1, 2010 at 10:32 pm and is filed under Rock Climbing, Trip Reports. You can follow any responses to this entry through the RSS 2.0 feed. You can leave a response, or trackback from your own site.